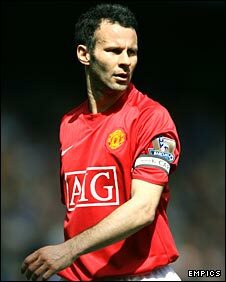 Manchester United winger Ryan Giggs is set to break Bobby Charlton's record number of appearances for the club in the Champions League final on 21 May. Giggs can surpass the England legend's record - which now stands at 758 - against Chelsea in Moscow after a recount of Charlton's career tally. "There's a very good chance [it will happen]," said boss Sir Alex Ferguson. Giggs, 34, was a substitute in the 4-1 win over West Ham and needs to play at Wigan next week to equal the record. It was thought that former Wales international Giggs could only level Charlton's Manchester United appearance record this season - until a 45-year-old mistake was uncovered by a club historian. Charlton, now a long-serving club director, has been listed as having made 759 appearances since he played his last match for the club in 1973. But it was discovered that this figure included an FA Cup third-round tie against Bolton Wanderers in January 1962, which he actually missed after being taken ill on the morning of the match. Should Giggs hang up his boots in Moscow? "It would mean more [than breaking the record] to win the Champions League and the Premier League," said Giggs. "Personal records are things to look back on when you finish you career. "Yes, it would be a proud moment if I do it but the main thing now is trophies." Since making his League debut against Everton in March 1991, Giggs has won nine Premier League titles, four FA Cups, two League Cups and the Champions League in 1999.